Awaiting the Desolation of Smaug movie, the second chapter of Peter Jackson’s trilogy based on The Hobbit by J.R.R. 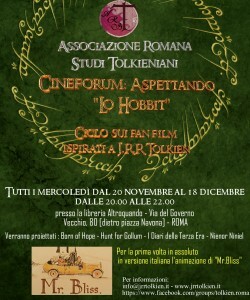 Tolkien, the Roman Association of Tolkien Studies – ArsT (www.jrrtolkien.it) has scheduled a series of fan-films related to The Lord of the Rings. Despite these films are often produced with a small budget by the followers themselves, the fan-film category has become a stand-alone movie genre. Over the years the quality of those productions has risen unbelievably as a consequence of the screenplay improvement and the efforts of directors and actors. The crowdfunding, an exclusively online sponsorship, lies at the bottom of this great fan-films gain in value. From November 20th to December 18th, ArsT’s members will screen, each Wednesday evening (8-10 p.m), one fan-film concerning the Middle Earth with exhaustive introductions about the movie in hand, exclusive guests (directors, actors, creators) and final question-times. On November 27th, on the occasion of the screening of the first Italian fan-film Diari della Terza Era, the director Claudio Ripalti and the protagonists will attend the evening meeting. On December 4th there will be shown, for the first time ever, the Italian translation of Mr. Bliss, a 2004 Tolkien Texts Translation production with the animation of Tolkien’s original illustrations, directed by Gennadij Tiščenko. A special evening will be dedicated to the sneak previews of the upcoming fan-films: Nienor Níniel, The Silmarillion, Storm over Gondolin and Tales of Fili and Kili. Finally in Rome, in the city centre! 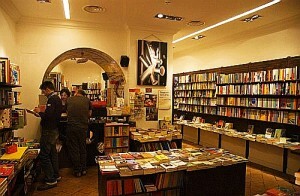 At the Altroquando bookstore, nearby Piazza Navona, every Wednesday evening (8 – 10 p.m.). – December 18th: Previews – Nienor Níniel, The Silmarillion, Storm over Gondolin and Tales of Fili and Kili.